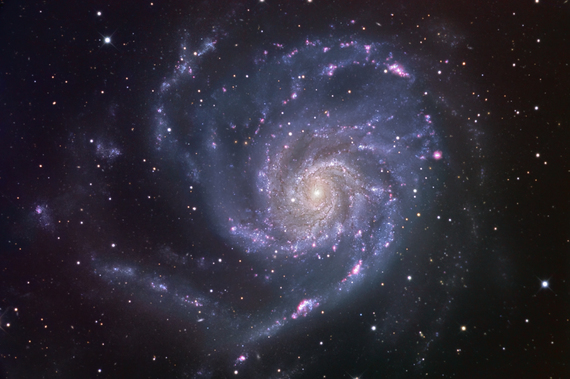 M101, aka NGC 5457, aka the "Pinwheel Galaxy" is about 27 million lightyears distant in the constellation Ursa Major. It spans 170,000 lightyears in diameter, making it a huge spiral, albeit somewhat asymmetric in appearance. In fact, Arp included M101 in his "Atlas of Peculiar Galaxies". This image is fairly deep, showing the arms quite clearly, including the numerous HII regions that indicate areas of active star formation. Supernova PTF 11kly with a magnitude of 13.8 appeared in 25 August 2011 and by September 5 had brightened to 10.2. This 2.5 hour Lum image taken by Teri Smoot 02/2/09/2011 starting at 0229 UTC shows the supernova with diffraction spikes, and a magnitude estimate of 10.27 (calc with Maxim). To see an old version of M101, click here.